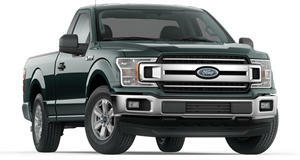 Dearborn sold over 70,000 F-Series pickups for the ninth month running. 70,000 is a lot of vehicles. But that's how many Ford sold last month. And what's more is that it's achieved that mark for the past nine months running, setting a new record in the process. Of the 187,096 vehicles that the Blue Oval moved over the course of November 2018, 72,102 were F-Series pickups, making that line far and away its most successful. That number by itself is more than twice the number of , and tops the combined total of Ford and Lincoln SUVs that it sold over the same period. Not that the sport-utes weren't trying. Sales of the new rose nearly 8% last month to 4,264 units, joined by another 1,566 (up 27.3%). And what's more is that the bulk of each of those were bought in top-level trims, helping Ford achieve higher transaction prices across the board, averaging $33,400 per vehicle. That's $1,600 more than last year, and $780 more than the industry average. Lincoln's sales were further boosted by other crossovers like the MKX and Nautilus, which went up over 20%. The new Nautilus, which just went on sale last month, accounted for roughly half of the brand's sales. The success of Dearborn's taller vehicles – pickups, SUVs, crossovers, and vans – helped Ford claw back some of the ground it lost this month as fleet sales dropped 7.1 percent, accounting for the bulk of its overall 6.9-percent decline in November.